Firstly: for arranging yourself (and I blame you entirely for this, Facebook) so that I accidentally Liked someone's rather miserable status update yesterday. Argh undo undo! There is no social etiquette yet devised to handle such situations. Secondly: so, one of my old friends from my small home town has been involved with the younger sister of someone else I know from said small town for some years now. They bought a house a while ago, have one child together, all happiness. But apparently no more. Because something happened, and now they have broken up - I think? I am guessing? - and all I know about it is a group invitation, by my old friend, to a group called something like '[Old friend] admits he was a total, total idiot for losing [girlfriend]', with the stated aim of the group being to get as many people as possible to join and witness his public humiliation in this fashion, so that Girlfriend realises how much he regrets whatever unspecified thing he did. Even though he knows she'll never take him back. But just so she knows how sorry he is. I wouldn't disagree that he did a Very Foolish Thing, whatever the foolish thing in question was. And he does indeed seem very, very sorry. But... seriously, no. Bad idea. Absolute worst idea in the world if your aim is to make the girlfriend less pissed off with you. Because I can guarantee you, from her perspective, this does not look like 'Oh, he really is sorry, maybe I should reconsider my kicking-him-out-of-the-house stance.' It looks like 'Fantastic - not only has he done [unspecified Bad Thing], but now he's passive-aggressively recruiting everyone I know into the campaign for me to take him back out of pity.' 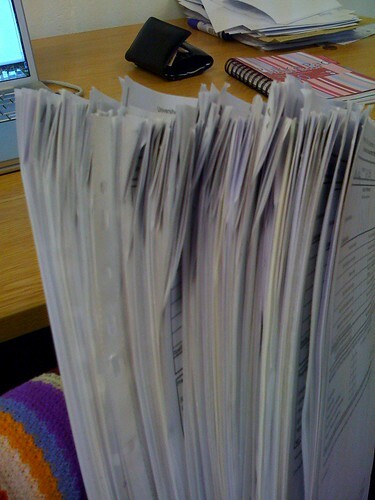 Desperately regretful ex-boyfriends of the world, take my word for it: this is not going to help. Leave her alone. Facebook, however, gives me two responses to this situation: 'Join This Group' or 'Reject Invitation'. Nuanced, it isn't. Down in London for work the other day, with a long, long day between travel. I've never liked London. It's big and incomprehensible and dusty, and you never know where the hell you are. But it does contain the British Library, which will forever be a mark in its favour, and it also contains my little brother, which I remembered the night before leaving. Ah, well, he's not at work, he's easy to get hold of. "Where are you? I thought we were meeting up at half past." "Yeah, but I can't work out how to get there. Where's the best tube station for the British Library?" "I don't know you live here." "Ohhh... [pause] King's Cross, okay? Meet me by the stairs." "See you in fifteen minutes, okay?" "I can't see you. Meet you by the exit onto Euston Road?" "I'm already there! By St Pancras." "Well, you're not, because I'm already there and I don't see you." "Right. Location. I can see the road, um, a man selling newspapers..."
"I don't think that's going to narrow it down, baby brother." "King's Cross is on my left." "Mmm. I'll ask a policeman." [Fuzzily, just about audible:] "Excuse me? Hello? I'm trying to meet my sister, but she doesn't know London very well. Do you know anywhere that's good to meet someone here?" [Even more fuzzily:] "Oooh, depends. Where's she coming from? [Still fuzzily:] "She says she's at the underground by St Pancras. But I don't think she is. But she can see the station." [Still fuzzily:] "You could try King's Cross?" [My brother again:] "Okay, the information point at King's Cross. Can you find that?" I found that. He introduced me to his friend as 'my sister, who has weird thumbs', I described being mortified by proxy that he actually asked for directions, he explained that this is what policemen are for in London, tsch, etc. There are students all over the city. New students, fresh and wide-eyed. And my enthusiasm for working with first-years, it turns out, does not extend to having to share a city with them. I'm not usually the kind of person who can be chafed into a constant low-level bubbling rage by the presence of Other People Being Annoying, but first-years moving slowly across campus in groups of 25... grargh. Students coming back means freshers' week, and freshers' week means NOISE, especially on campus during the day. There was one very loud outdoor party recruiting for something-or-other which went on for so long that plans were devised to shut it up so that some of us could get on with work (specifically, my boss and the dean were going to head down there and party like it was 1979 until the whole thing dissolved through terminal uncoolness). Also, it means that grand old British tradition of the POSTER SALE!!! !, which you have to write with that many exclamation marks, and the people handing out flyers, who even tried handing them to me and one of my colleagues the other day ("Aww! No, but thank you so much!"). And it also means, for some of us, a desperate scramble to timetable classes around students' other classes, because we do not have any kind of central timetabling system to do that for us. I don't know why we don't have central timetabling. The last place I worked had central timetabling, all the places my friends work have central timetabling, but here, you say 'Why isn't this done centrally?' and you get baffled looks. Why, nobody does this centrally! It makes much more sense to work out when compulsory classes should be by getting all the students to vote! Even though that inevitably means saying 'Okay, who actually can't make Thursday at 4? ', and then getting annoyed with students who say they can't because they're working that day, because we shouldn't have to organise their classes around their lives. And I agree that we shouldn't, but perhaps the students wouldn't think otherwise if we weren't asking them to pick times for their classes in the first place, maybe? Students are back, and now I have to teach them stuff I hadn't even heard of myself until this year. So. Fingers crossed. 1. Mentally reading all the long Ss as Fs, no matter how much better you know. 2. Finding the above hilarious. My flat is leaking. Only a little, to its credit, but still more than I would prefer from a flat. And quite persistently, too; it's filled a bucket four inches deep with strangely-coloured water since this morning. I need that bucket, dammit. 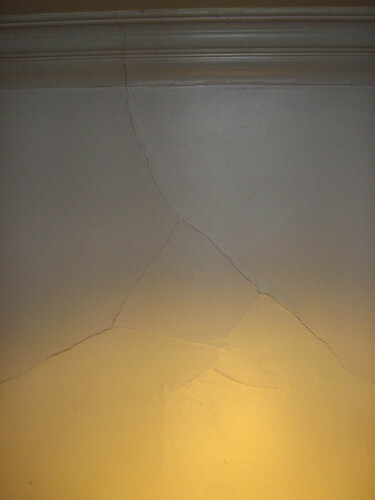 This crack grew, and grew, and spidered its way across half of the flat, until it spanned three rooms, ran down outside walls, and disappeared off into the hall outside. The ceiling right above my bed started sagging in a bad way. And my landlord had decided to kick me out in order to sell the place the week before, which made the "You know that crack in the ceiling you said just needed a bit of Polyfilla? Well, not so much" call that much sweeter. So, things could be a lot worse than one little leak. And no pre-teaching nightmares yet, either! This last term was the first in which I didn't teach anything since I started during my PhD, and that's a strange thing to experience. I do sort of understand why so many of the academics I know highlighted the break from teaching as a fantastic thing about my job; the research I'm working on has involved a fairly steep learning curve, and yeah, I'm glad I didn't have to juggle that with the teaching loads I've had before. But I like teaching. And I miss teaching. And truly, I do not say this as a naive first-year TA who does not understand what teaching can do to the time you thought you had in a working week. I'm not teaching very much this time round, and what I am teaching is not in an area I've taught anything even close to before. Which is fine. Nice change. Good for the cv, etc. But I also won't be teaching my absolute favourite thing to teach, which is first-year classes - for preference, first-year classes made up of students who don't really want to do English and aren't sparklingly brilliant at it either. I love these classes. I don't really understand why everyone else doesn't, and why the teaching most desired seems to be final-year or postgraduate-level classes in your own specialist area; I've taught upper-level undergrad classes in my own area, and in an area that wasn't my own, and they were a lot of fun, but they're definitely a different kind of fun than teaching the first-years. It's a whole different kind of teaching, in fact. And I think it's a shame when new TAs already see first-year teaching as an unpleasant obstacle to be hurdled in some kind of academic trial, so that you can get onto the good stuff. Please hold while I obtain your balance, your account details, and your incandescent aura of rage. "Please press 8 to speak to a customer service representative." I don't know why it's 8. Options 1-4 are about borrowing money, moving money, or opening accounts in which to keep more money. Option 5 I forget; options 6 and 7 don't exist. One of these days, I'll press 6 and see what happens. But not today. "Hello, Dr Blue. How can I help you?" "Hi! I'm calling about a letter you sent me a couple of days ago." "It says you're reducing the interest-free portion of my overdraft to £1000, and that you're charging a fee for that, because I went over my overdraft limit a few months ago. And you always charge a fee for doing anything with overdrafts more than once in a six-month period." "Right. That's our policy. Any time you request a change to your overdraft arrangements -"
"Okay, but, I didn't request it. The letter you sent me says it's just an automatic thing, because this is Year 2 of a graduate account." "Yes. That's how they work." "And I'm getting charged for this because this arrangement happened after I went over my overdraft limit before." "Yep... yep, I can see that from your record here. That's why they charged you." "But if I hadn't gone over my overdraft limit before that arrangement, I wouldn't have got charged?" "Well, not if you hadn't requested any other overdraft limits before then, no." "Right. See." Take a breath. "It's just, you already did reduce the interest-free portion of my overdraft to £1000 a few months ago. I have that letter here from you saying so. It's dated June the 8th. And that was before I went over my overdraft limit. So... why am I being charged now?" "Can I put you on hold for a minute, Dr Blue?" No problem at all, because I have beaten the bank, smugness smugness victory. They cannot possibly dispute this. I have two letters in front of me saying the exact same thing about reducing my overdraft, except one of them's dated June and one of them's dated August. They cannot possibly charge me for changing something in August when that change already happened back in June. They cannot possibly. 1) They have no record of the earlier letter on their system. As far as they are concerned, the overdraft changes are happening at the end of September only, and thus I am liable for the fee. 3) After me pointing out that it does not say it has come from the branch, that the contact details given are the central telephone banking number rather than the branch, and that it is signed 'Colette Nugent, Head of Customer Communications', they told me to go into the branch in person and have them explain it to me. 4) After me pointing out that a) the branch is 250 miles away and b) the letter really honestly looks pretty centralised to me, they told me that it has to be sent from the branch, because the branch deals with specific matters about the exact amount your overdraft is for, while their letter is not about specific amounts and interests and is just a 'general overdraft review', so it's really not the same letter at all. 5) After me pointing out that the two letters said the exact same thing, about the exact same arrangements, quoting the exact same amounts, about the exact same account, with the only difference being that the formatting was better in the first letter, oh yes I went there, they said they could not hear me properly on this line and could I phone back during branch opening hours please. I suggested I write to them instead, and that way I could send them a photocopy of both letters and they could clear up the mystery from their end. They said sure, and I was welcome to address that to the manager of my local branch.